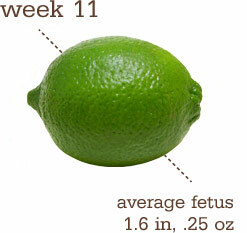 Your fetus is about 1.6 inches long, and she’s got about a 1:1 head-to-body ratio. She now weighs in at about .25 ounces. By week 11, her tooth buds, hair follicles and nail beds are forming. Her skin is see-through, but she’s on her way to looking more like a baby. Her fingers and toes aren’t webbed anymore, and she’s moving fluidly and gracefully in there, even though you can’t feel it. Pretty good….I’ve been fighting with mild on and off nausea sort of from the get go, but it’s definitely starting to decrease now. I was really able to pinpoint it to when I had no food in my stomach, so for the last month I felt like I was constantly standing in the kitchen eating random stuff all day long. Also, it would hit if I got too hot, which pretty much happened every single day, either out on a walk or out at the park, or out in the backyard. Summer in Texas! Also, the crazy overwhelming fatigue has gone away, but I still feel more rundown than usual. Which I suppose is to be expected, what with growing a human being while entertaining a toddler all day. It was definitely easier last time when I sat in a nice, quiet air-conditioned office all day. But, being able to go to the pool whenever we want is pretty nice, too. Let’s see, what else? My back is already starting to hurt, so I think I need to do some stretches to see if I can work it out. I didn’t really do any exercise consistently after U was born, so I know my stomach muscles just have stayed weak and unused, so I’m expecting some back pain since I don’t have those strong abdominal muscles helping out! So far, I think about 5 lbs? See above, eating ALL DAY LONG. It’s a little hard to be pregnant in the summer, when margaritas and beer seem to abound, but I also love a good fizzy Coke, so that mostly makes up for it. I have have flitting cravings this time. I keep smelling food (that isn’t anywhere around me, so I know my brain is making it up) and then I instantly want it. But then just as soon, I think of something else. So….kind of not unlike how I am about food when I’m not pregnant. Moving on. We actually are on good footing. I saved every single thing of Urijah’s, and plan to use as much of it as we can. We are going to move U into the guest room a few months before the new baby comes so that he can get used to it. He’ll keep his crib since it will eventually convert into a toddler bed and then into a full size bed. That way we can leave the nursery just as it is, and no redecorating is necessary since it’s totally gender neutral. We’ll, of course, have to get a few things, but mostly, we’re covered. I’ve started cleaning out under the guest room bed, and will have to tackle the closet in there next. So, we just need to figure out how we are going to decorate U’s new room, so we can get to painting it, and getting it ready. I got to hear the heartbeat today (Tuesday)! I stopped into the birth center on the way to the playground with U to see if Heather had a minute to check for it (since at my first prenatal appt it was too early to hear it). She did, and it sounded great. She did feel my uterus and was surprised at how high up it already was, and threw out a joking “maybe you have more than one in there?” We only heard one heartbeat, but as I was leaving she said she was sort of only half joking about that, and that she would be interested to see how my belly grows this time. My next regular appt is next week, and if she seriously thinks it is worth double checking, I’ll have an ultrasound, but I think the odds of more than one baby in there are pretty small. Right? This is an informal belly picture I took just spur of the moment. We’ll commence with the ‘real’ ones next week. Baby King v. 2.0 is on the way and I’ve been requested to do weekly updates again. I wasn’t planning on blogging about the pregnancy this time, just because I didn’t think I would be very good at keeping up with it, but the people (well, person, really) has asked, and you must give the person what they want! So, I’m dusting off the old blog, making some updates and changes and we’ll get to the updates ASAP. You can see that I’ve added a new “belly pics” page and that the pregnancy ticker on the side is already up and running with the new and current info. Yesterday was 11 weeks, so I’ll be working on that update, hopefully to post tomorrow, and then we’ll get down to regularly scheduled business after that!